Seven ships will be participating in Exercise SILVER: two Halifax-class frigates, three Kingston-class coastal defence vessels, two Orca-class training vessels, along with a Port Security Unit of more than 100 specially-trained reservists and an operational dive team of clearance and port inspection divers, equipped with twenty rigid-hulled inflatable boats. Exercise SILVER is part of the 2010 Integrated Exercise Program, a program designed to ensure we are prepared to respond in a coordinated manner to any potential emergencies that may occur during the Winter Games. 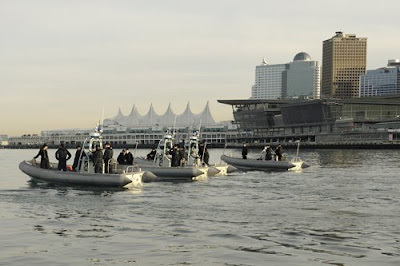 For the Navy, Exercise SILVER builds on the existing working relationship between the Navy and RCMP and our other partners in maritime security. My regular readers will know why I *had* to include this picture…lol.. Today is exactly one year from the start of the 2010 Olympic Games.